Since NYCHA already has a deal with electric utility and can’t directly use the power generated from the solar panels, it plans to lease their rooftops for community solar projects. This is all part of a larger effort to reduce city-wide greenhouse gas emissions over the next 50 years. 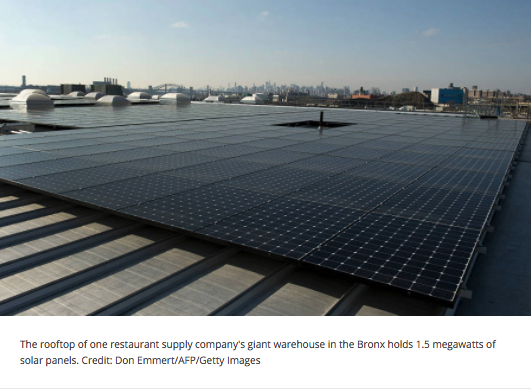 Here is an example of a solar array atop a commercial building in New York City. Community solar allows individuals to enjoy the benefits of solar energy even if they don’t have a property or roof on which to install solar panels. Individuals who rent their units, or live in condos or apartment complexes, do not have the ability to install solar themselves. To finance these solar projects, utilities will typically purchase around 40% of the system or power production, and the remaining 60% can be purchased as shares by community members. With Virtual Net Metering (VNM), participants can receive net metering credits based on how much their share of the solar plant produces. While they don’t share an electric meter with the plant, individual share owners can use these credits to offset their own electric bill where they live. The concept works quite simply: “If the participant’s share of the plant produces 5kWh of electricity on a given day, they will receive 5kWh of solar Net Metering credits on their power bill,” explains EnergySage. Massachusetts Department of Energy Resources (DOER) put together a comprehensive report of research on the different ways to structure a community solar project and the potential these various options have in Massachusetts. This report suggests that 22% to 27% of all residential buildings have the capacity and are suitable to hold PV systems, which demonstrates the potential that solar energy can have in a state such as Massachusetts. With community solar projects now in 26 states, many jobs and training opportunities have been created through this market shift. The NYCHA project alone requires that 30% of the hires have to be NYCHA residents, which also incentivizes the residents to support this renewable energy project that would provide economic opportunities to residents. The benefits to community solar projects definitely outweigh the costs and it will be interesting to see how these types of projects transform the renewable energy field in the years to come.